A quick fix… MacGyver style..
Wouldn’t you know it. Just one day after I call to order replacement parts for my bipap, something happens where I need a spare part. Unfortunately, I had no spare part. So, I had to MacGyver up and find a fix. Now, I know you are wondering if I’m up to the task of becoming a MacGyver. You know the TV show where he fixes things in the knick of time to save the world from odds and ends that just happen to be lying around near him. A gum wrapper, a toothpick, or a spring from a ballpoint pen would do nicely, right? Well, none of those things would help in this situation. But never fear! MacGyver girl is here! Notice that Rocco always makes sure he is comfortable next to his mommy. Don’t look too closely. It’s so NOT a glamorous picture of me. So, where was I? 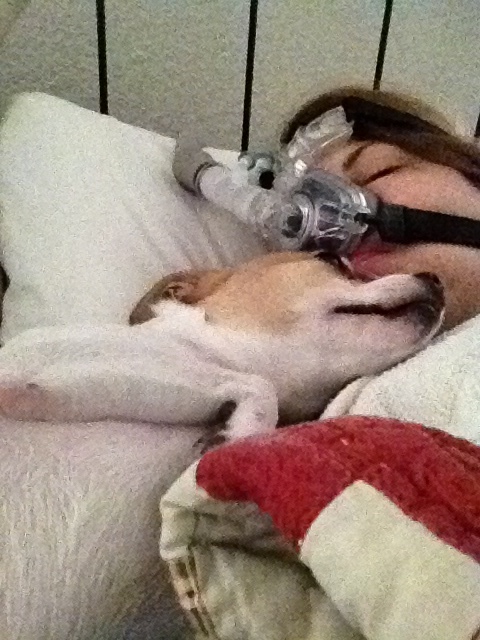 Oh yes, getting ready to put on my bipap mask to lie down. When I put on my bipap mask, I usually turn on my bipap machine first. Then I slip the head gear over my head and strap it on around the back of my neck to connect to the front of my mask. I connect my oxygen next but when I did that, I noticed some air blowing on me that wasn’t coming from the part of the mask that is suppose to blow out some of the exhaled air. I was like, “H-E- double cheese sticks! This can’t be happening!” I was tired and didn’t want to have to do anything but sleep. You know how that is. When you are tired, you’re tired! 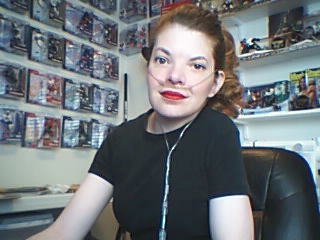 I looked the full length of the hose of my bipap. Didn’t see anything. Then I ran my hand down the length of the hose and that’s when I felt the air coming out and saw a good sized hole. Here I am pulling my mask off, putting my oxygen back on to go in search for a spare hose which I could not find. Nerts! 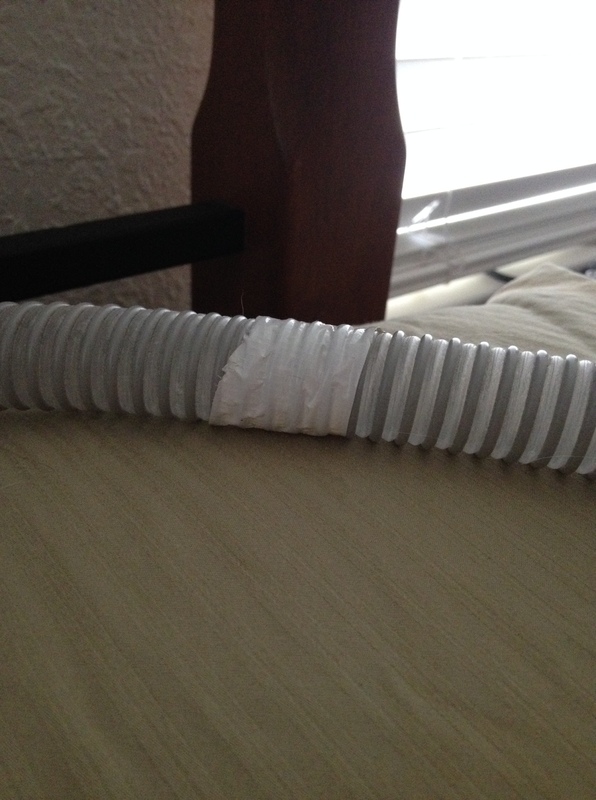 About twenty minutes later, I give up the search and go for my handy dandy, fix everything duct tape. Yep, that’s right. My house is NEVER without duct tape for this very reason. It generally will fix everything I need it to fix. It’s so vital to me that I even pack a role of duct tape in my suitcase for vacations. Really? Yes, really. K just rolls his eyes when he sees me packing the duct tape for vacations. I just tell him that someday he’ll thank me! You just never know, right? Taping a hole closed is a little tricky on this hose. I used my finger nails to wedge the tape in-between the ridges around the hose to ensure a tight seal. I now have a patched up bipap hose! Yes! I could resume nap time! I’m still awaiting my supplies. It’s been about 3 days now and there’s no telling when they will come. I just wanted to order them before the new year because the insurance deductible restarts on the first of January. Don’t forget to email me for the next “Need a Hug” afghan giveaway! Check this post for the rules. The first afghan has been sent out to Gerard. Congratulations sir! Follow my blog to keep updated with email notification of my new posts. HAPPY NEW YEAR!! !